Quintessence of Dust: Does it take special genes to make a special human? These biological specializations do make us human, and that makes them interesting and important. But biologically, I have always thought of them — all of them — as incremental changes to an ape blueprint. I have never thought of human biology as something extraordinary. And for that reason, I have always been skeptical of attempts to find human-specific genes or proteins or cell types that would explain human specialness. Now, I don't mean that I don't think there are human-specific changes in the genome. Every species has species-specific genetic components, essentially by definition. But I never expected that we would find extraordinary new genetic components in the human genome, since I never thought our biology was extraordinary. Same goes for special cell types: some really smart biologists have looked for human-specific nerve cells in the brain. The human brain is big and complex, but it has always seemed to me to be built of the same stuff, in the same basic ways, as all the other brains I studied in my career. Here is an example that illustrates my point. FoxP2 is a control gene involved in brain development, and because mutations in FoxP2 lead to loss of language in humans, its roles and evolution are of intense interest. It was first thought perhaps to be a human-specific gene, indeed perhaps "the language gene," given its strong link to such a special human trait. But no: FoxP2 is an ancient gene found throughout the animal kingdom. The human version is different from the chimp version by just two amino acids. This is pretty much the opposite of a "human-specific gene." It's a human version of an ancient gene. Interesting, for sure, but not something truly new or unique. A truly new and unique human gene, for my purposes here, would be a gene that makes a protein that is unique to humans—a protein never before seen, not something merely tweaked from a precursor. What would that even look like? And how could it happen? Let's tackle that first question. What would a completely new gene, something uniquely human, look like? I suggest that we think of uniquely human genes on a spectrum. At one extreme we would find a human-specific version of a gene that is found in lots of other mammals (or animals or eukaryotes or whatever). The specific form of the gene might be unique to humans, and it might even have profound functional consequences. But the gene is not new, and the human-specific changes are subtle. FoxP2 is an example. What might we find between those extremes? One kind of "new gene" would be an old gene that has been dramatically changed into a human form that is REALLY different from the non-human versions. For example, some genetic changes can result in the truncation of a gene, so that it now encodes a protein far smaller than the one encoded in the original form of the gene. Such changes can create proteins with very different functions, and we might decide in some of those cases to designate the shorter gene as a "new human gene." It's a bigger change than the editing of FoxP2, but something less dramatic than the appearance of a new gene or protein from (seemingly) nowhere. Another intermediate type of "new gene" would be the kind that results from the fusion of two previously existing genes (whole or in part). This kind of change is well known in genetics, and the basic mechanisms that create new "fusion proteins" are fairly well understood. Such proteins can exhibit new functions, distinct from the functions of the two previous proteins that were fused. That seems to be a "new gene," but it's still not quite the complete novelty that I put at the extreme end of the "new gene" spectrum. Running parallel to all of this, we know that genes are regularly duplicated in human (and all other) genomes. A "new gene" can come about when an old gene is copied to another place in the genome, and then tinkered with (by mechanisms including the truncations and fusions just mentioned) until it has a new function and achieves its independence. So does that mean that there is really no such thing as a "completely new gene," and that I've set up a silly straw man at the far end of the new-gene spectrum? I don't think so—there are indeed mechanisms that can create brand-new proteins, overnight. The Arhgap11b story is remarkable in part for that reason. But to conclude here: I wrote this post to do a bit of confession. I never thought it likely that we would find "special genes" that are required to make humans. The FoxP2 story exemplifies what I expected to find in human evolution: tweaking of existing systems to make amazing new things. I always saw human evolution as the straightforward bringing-forth of developmental potential that was already there. I saw human brains as pumped-up ape brains, and nothing more. But the Arhgap11b story shows that I was wrong. One of the most notable humans specializations of all, the overdevelopment of the cerebral cortex, is tied in part to the action of a protein that breaks the mold. Arhgap11b seems to be that thing I thought we would never find and need not seek: a completely new human gene. The story is a bit more complicated than that, and of course the gene didn't appear "from nowhere." But it's new, in a way that is worthy of special attention. And it suggests an answer to the question that comprises the title of this post, and answer that would have surprised me somewhat just 10 years ago. The answer is: "Yes, probably so." 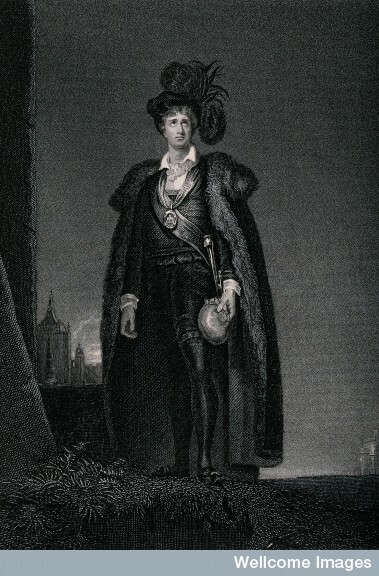 Image: Kemble in the role of Hamlet, standing on a grassy bank wearing a long cape edged with fur and a large feathered hat on his head; he is holding a skull in his hand. Engraving after Sir Thomas Lawrence. Courtesy of Wellcome Images.